Extreme Blue clocks undergoing testing at TimePilot. 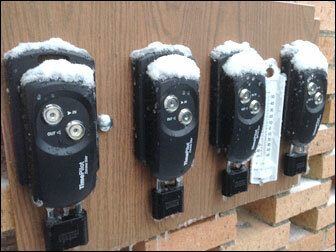 They've been running perfectly for months, even at temperatures of -11 F.
Collect data with your smartphone! We started with a proven product: TimePilot Extreme. Then we added an idea: Today’s smartphones have the power of a desktop computer from just a few years ago, so why not use that power for something more than phone calls, texting and games? And we came up with TimePilot Extreme Blue and TimePilot Extreme Blue Enhanced. These battery-powered, weatherproof timeclock systems collect data just like TimePilot Extreme did. But when it’s time to retrieve your data from your clock, you use your smartphone’s Bluetooth wireless technology and TimePilot’s free iPhone® or Android app. The apps do all the math for you and give you each employee’s hours for the pay period. The apps can handle overtime and rounding. With Extreme Blue, you can cut your paychecks right at the worksite. It’s a simple system and you don’t even need a computer to use it. Extreme Blue Enhanced is more powerful and includes the time-tested TimePilot Central Windows-based software. Supervisors in the field collect the data wirelessly onto their smartphones, make any corrections necessary, then use the app to send the data from their phones to your headquarters via Dropbox, a free Cloud service. At a PC running the TimePilot Central software at headquarters, you can merge data from multiple supervisors and multiple sites, run reports or prepare the data for payroll software like QuickBooks or services like ADP. This gives employees the ability to clock in at one site and clock out an another. Of course, as with other TimePilot products, there are no monthly fees to use Extreme Blue or Extreme Blue Enhanced. If you have a TimePilot Extreme system now and use TimePilot’s Enterprise software, you can add Extreme Blue clocks without problems. You can use the app with the new clocks, or you can skip the apps and download the data from Extreme Blue clocks the traditional way—with the same USB drive you use for your current Extreme clocks. TimePilot Extreme Blue starts at $529; Extreme Blue Enhanced (with TimePilot Enterprise software) starts at $849. Learn more about Extreme Blue and Extreme Blue Enhanced at our web site, www.TimePilot.com or by contacting us at info@timepilot.com or 630-879-6400.